The Ron Quinton trained Dixie Blossoms will join stablemate Daysee Doom in the Coolmore Classic after scoring a brilliant first up win in the Group 2 $200,000 Guy Walter Proven Thoroughbreds Stakes (1400m) at Randwick today. 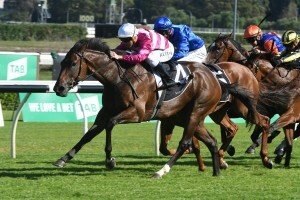 Dixie Blossoms, above, scored a first up win in the Guy Walter Stakes at Randwick. Photo by Steve Hart. Daysee Doom resumed from a spell to win the Group 2 $200,000 Vinery Stud Millie Fox Stakes (1300m) at Rosehill last Saturday and the two Quinton trained mares will face off in the Group 1 $600,000 Coolmore Classic (1500m) at Rosehill in a fortnight. Winning jockey Christian Reith had no hesitation in settling Dixie Blossoms at the tail of the fields in the early and middle stages and knew that he had the horse underneath him that was capable to rounding in the leaders. Reith eased Dixie Blossoms ($2.60 favourite) to the outside once heads were turned for home and the five year old quickly picked up momentum and went on to record a three quarters of lengths win over Raiment ($7) with the leader Francaletta ($4) fighting on for third. “We thought we had her in great order,” Quinton said.